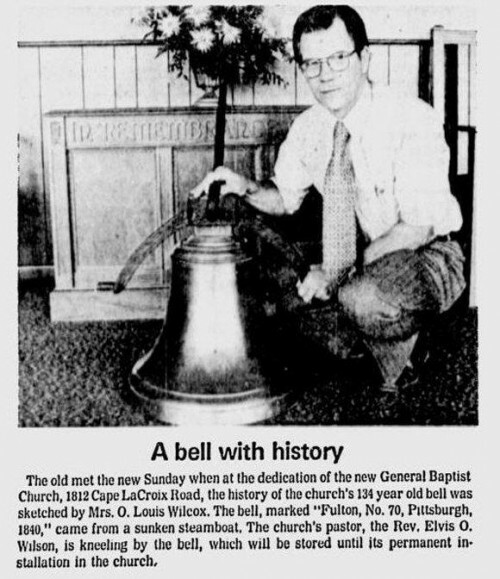 I wondered in my story about the original First Baptist Church if the bell salvaged from a sunken steamboat was still in the 200 Broadway church or if it had been moved. 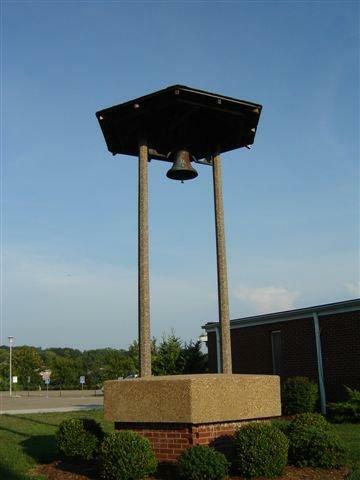 It didn’t take long for Mitchell Givens to send me this photo of the bell at the First General Baptist Church. Mitchell, CHS Class of ’59, says the bell is attached to a motor and can be rung from inside the church. He and James Baker hooked it up. Bill Reiker was responsible for the brick work. He also sent this clipping. I assume it was from The Missourian. I did another church bell story a year ago when I published photos of the razing of the First Presbyterian Church at the corner of Lorimier and Broadway and its subsequent re-belling. 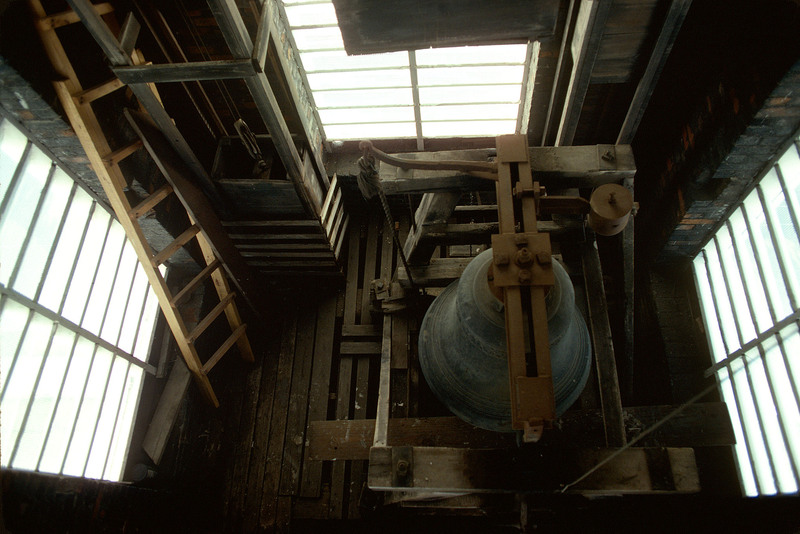 Here are photos taken in the bell tower of Trinity Lutheran Church before it was torn down. …”ah the bells” Lon Cheny accent used here. Very cool follow up on the bells…I will drive out to the General Baptist church on Cape LaCroix and look at it today on my way out of town. Ken, thanks again for enlighting a hometown boy on his own hometown! And what great name for a minister…Elvis O. Wilson. 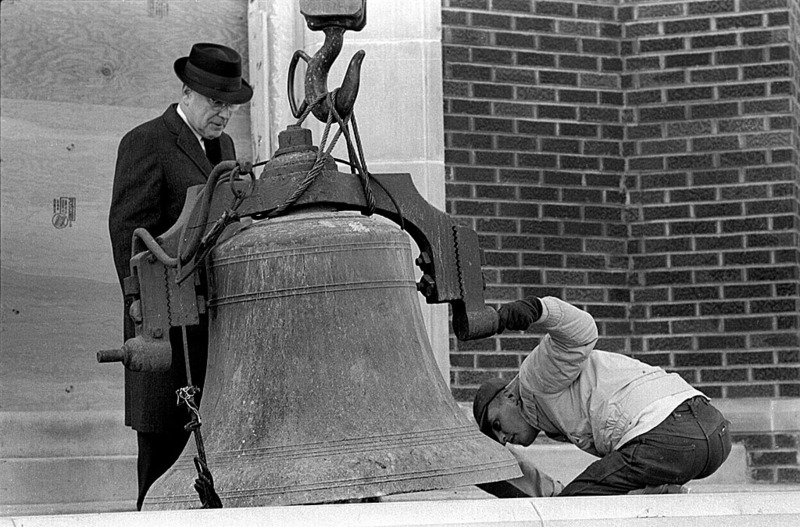 I think I’ve seen your posting pictures of the old Trinity Lutheran Church bell before. It brings back memories of climbing back there a few kids at a time when I went to Trinity Lutheran School. I no longer recall the age we were when that happened, but it was very cool that they allowed us to do that! My grandparents lived on Pacific Street next to Knaups Flower Shop, and I remember hearing the church bell from their house. Thanks for the continued postings!